Electronic Data Interchange, commonly referred to as EDI, is a process that allows data to be exchanged between businesses in a standard electronic format. Sales order processing is an area of business where EDI is used extensively. However, up to one-third of EDI orders can contain exceptions — this is where problems surface. Traditional handling methods cause a host of challenges for customer service professionals and the business as a whole. 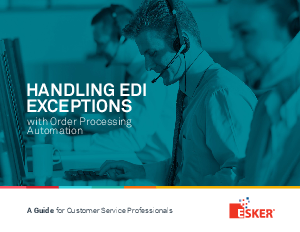 This eBook aims to expose these issues, while showing how order processing automation can work with existing EDI environments to streamline exception handling and fix any potential problems before they mess up your ERP system and bottom line. Learn more about EDI Exceptions, download now!